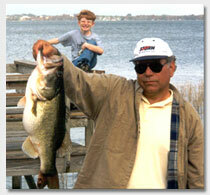 7,806 acre Lake Eustis is the center lake in the vast Harris Chain of Lakes. The lake and the adjacent city on its northeast shore were named after General Abraham Eustis, a hero of the civil war and the first and second Seminole wars. The lake is approximately 4 miles wide and 5 miles long. Lake Harris can be accessed through the "Dead River" in the south west corner of Lake Eustis. Dead River is the old Florida name for a river that connects two lakes with no current. The scenic "Dora Canal", in the southeast corner of the lake, leads directly to Lake Dora, the City of Tavares waterfront and the City of Mount Dora beyond. Both the Dead River and the Dora canal are navigable in a small boat. The Dora Canal has many cypress stumps which can be a hazard in times of low water. Lake Griffin can be reached through Haines Creek. Haines Creek is deep and totally navigable over its entire length. A manned lock is located half way through Haines Creek which is open during daylight hours. The lock master has been known to take a lunch break around noon, so plan your trip accordingly. Lake Eustis is the location of the majority of Harris Chain waterfront restaurants. The Hurricane Dockside Grilll is on the Dead River with spacious waterfront docks where you can tie up for lunch or dinner. Another popular pastime is to boat to the City of Eustis municipal docks and take a short walk into downtown with its quaint small town atmosphere and nice restaurants. 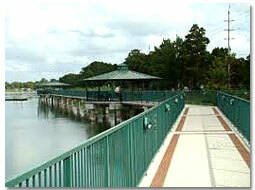 The Eustis Lake Walk is a modern concrete walkway running along the shore of Lake Eustis with a panoramic view of the lake. Fishing and gator watching are popular pastimes on the Lake Walk. There are two public boat ramps on Lake Eustis. The popular Buzzard Beach ramp is located between Tavares and Leesburg on Highway 441. The Eustis city ramp is located on Lakeshore Drive just south of the City of Eustis. Except for a small section of shoreline on the southwest side, Lake Eustis is surrounded by lakefront homes and boat docks. Direct Harris Chain lakefront homes are generally pricey, but the numerous Lake Eustis canals make a waterfront lifestyle available to many homeowners. Harbor Shores on the northwest side of the lake has five canals, all leading to Lake Eustis. The Dead River has at least 4 canals and Haines Creek has numerous private boat docks and a couple of marinas. If you have questions about Lake Eustis, please contact us.